As many of you know, I’m a big proponent of do it yourself credit monitoring and score checking. I don’t think you should ever have to pay for something that is yours. Credit Karma is one of the only companies around that allows you to check your credit score absolutely free. I’ve been a member for over a year now, and they are constantly improving and updating their site. They’ve added a ton of new features since I’ve joined and the app is just another one of them. Their new mobile app makes it even easier to stay up to date with your score. Although it’s only on the iPhone platform, according to their website, it will be coming to the Android platform very soon. 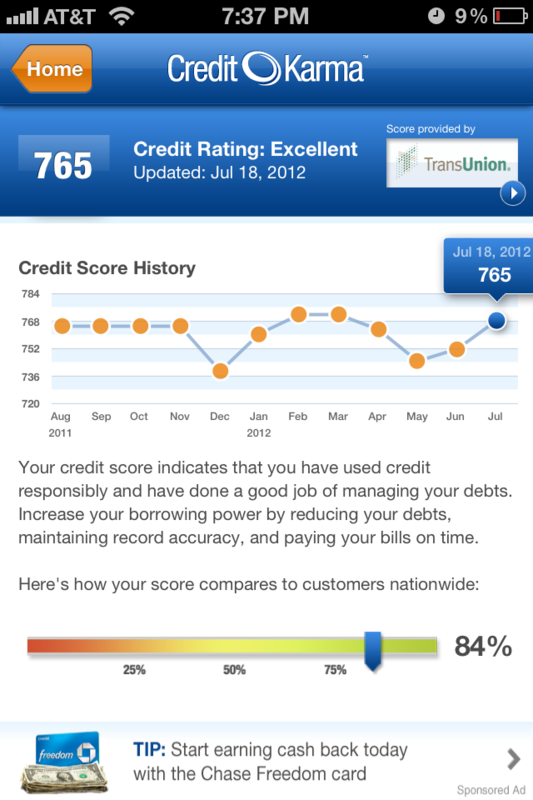 The app has a nice and simple interface that automatically updates your credit score every time you log in. I like this feature because when you use the website, you have to manually update your score. Obviously if I’m on the site or using the app, I want to know what my latest score is! I like how they made navigation from page to page very simple. 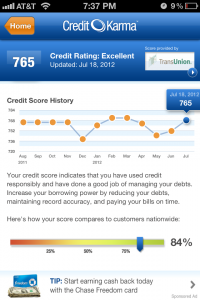 The home page takes you to a dashboard that gives you your updated credit score and a notifications section below. From there, you can look at your credit report card or take a look at your accounts. I actually prefer using the app over the website because of these simple features. Aesthetically, the site is very pleasing and the navigation pages make a lot of sense. From the homepage, you can go to your credit report that breaks down and grades you on the factors that affect your score: utilization, on-time payments, average age, total accounts, hard inquiries and derogatory marks. You can also navigate to the my accounts section, which is clearly divided into home loans, credit cards and other types of loans. This might be the only fault I see with the app. If you were to lose your phone, someone could potentially access your credit score and credit report. Personally this doesn’t bother me, in fact I’ve already shared my credit score 😉 so I’m not too worried about some criminal knowing my score. But I could see how this might be a little troubling to some. The app’s free so the cost must be an A right? Well, not necessarily. The trade-off here is the same as on the website. In exchange for your score and report, Credit Karma shows relevant ads on the bottom of the screen. I think this is a fair trade-off and the first ad I saw was for the Chase Freedom Card, which I think is a great starter card btw(no annual fee, and $100-$300 sign up bonus). Overall, I highly recommend the app. Ever since Credit Karma added their credit monitoring service, the site has become an extremely valuable part of my do it yourself identity theft protection plan. I check my score about twice a month, but the credit notifications is their best feature. The app has a nice notifications area too that will push notifications to your phone when there’s been a change to your credit history. So are you ready to sign up with Credit Karma(aff link)? If you’re already a member, you can download the app here.